Atopic dermatitis, also known as eczema, is a common skin allergy among dogs, second only to flea-allergy dermatitis. Eczema affects approximately 10% of dogs and is an inherited hypersensitivity to common allergens like pollen and dust. It typically shows up in dogs aged 1-3 years and often first appears in late summer or early fall when weed pollen is prevalent but, once established, can come at any time of the year as an allergic reaction to many things, both indoors and out. Sometimes shortened to the name "atopy," atopic dermatitis is painfully irritating and must feel for a dog the way a severe case of poison ivy feels to humans. Soon, if not therapeutically relieved, an affected dog's entire existence revolves around "scratching the itch." Atopica cyclosporine capsules are indicated for canine patients, four pounds in weight or more, suffering from canine eczema. While there is no cure for this disease, Atopica taken on a regular basis can alleviate the symptoms and relieve the painful itching, although it must be a continuing treatment to bring long term relief. Initial treatment consists of a single daily dose, administered orally, given at the rate of 5 mg per kilogram of body weight. After a one-month period of daily doses, treatment times may be tapered to every other day, then two times per week, until a minimum frequency is found that still provides desired results. The product package featured on this page contains 15 capsules, 25 mg each. Atopica is also available in 10 mg, 50 mg and 100 mg capsules. This product is contraindicated for patients suffering from malignant neoplasia. Its safety has not been established in dogs weighing less than four pounds or six months of age or less. It is not for use in pregnant, lactating or breeding dogs. Typically, few, if any, side effects are experienced when using Atopica, although occasional gastrointestinal problems can show up during the initial dosing. This may present as vomiting or diarrhea but often goes away as treatment continues. Sometimes, small changes in the dosing regimen will solve an adverse reaction. Gingival hyperplasia may also occur during this time. 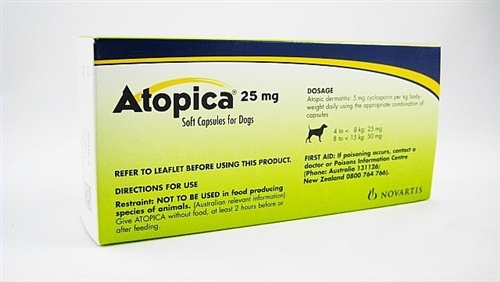 Brought to market by highly respected animal health industry leader Novartis, Atopica is only sold to licensed veterinarians and licensed pharmacies. It is for animal use only, and not for use on humans. 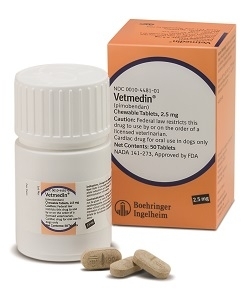 Vetmedin, for veterinary use only, is for treatment of dogs showing clinical evidence of congestive heart failure (CHF) as a result of atrioventricular valvular insufficiency (AVVI) or DCM, dilated cardiomyopathy. Its sale is regulated and is only available to licensed veterinarians and pharmacies. These beef-flavored, chewable tablets contain 2.5 mg of pimobendan each and are given in twice daily doses as an adjunct to conventional CHF therapy such as the administration of furosemide. Dosages are determined by the individual dog's weight, at a rate of 0.5 mg per kilogram of body weight, utilizing as many of the 2.5 mg tablets as needed. Total daily dosage is divided into two and administered at approximately 12 hours intervals. The two daily dosage portions need not be exactly equal. Tablets are scored for easy halving and total daily dosages should come close to the amount recommended, within a half tablet (1.25 mg) range. Vetmedin stimulates the heart to pump more effectively and efficiently by dilating the blood vessels coming into and leaving it, thus reducing pressure, increasing blood flow and decreasing the amount of work required for the heart to pump. This medication has been clinically proven to improve both the quality of life and the expected longevity of dogs receiving treatment. Vetmedin is administered orally and has been shown effective when used on animals displaying signs of mild, moderate or severe CHF. Since there is no cure for CHF and, as a slowly progressive disease that increases with age, therapeutic intervention such as the administration of Vetmedin is designed to improve symptoms and prolong life. Vetmedin should not be used in cases where augmenting the patient's heart output is not appropriate. This includes dogs suffering from aortic stenosis or hypertrophic cardiomyopathy. This medication is for animal use only and not for use on humans. The medication's safety has not been established for dogs displaying signs of asymptomatic heart problems or for those suffering heart failure due to causes other than AVVI or DCM. Safety has also not been evaluated in dogs six months of age or younger, in dogs born with congenital heart problems, those suffering from diabetes mellitus, breeding dogs or females that are lactating or pregnant. This quality product is offered by respected industry leader Boehringer Ingelheim. Detailed instructions explain exact dosages for specific weights. In many cases, one treatment may be all that's needed. In some instances, however, re-treatment may be required if the source of the problem, such as flea infestation, is not removed. 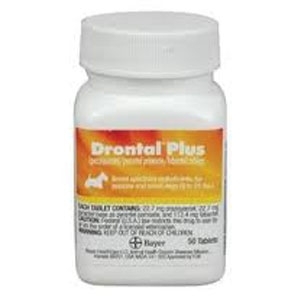 Drontal Plus is designed to be administered orally, either alone or with some small bit of food. Fasting before or after treatment is not recommended. Each of the three active ingredients contained in this medication works in a different way to effect treatment. Praziquantel becomes absorbed into the liver and metabolized and then excreted into the bile being sent to the animal's digestive tract. This causes the parasite to now be digestible by the host, thereby eradicating the tapeworms to the degree that only small pieces may be visible in the dog's feces. Pyrantel Pamoate works by causing spasms and paralysis to ascarids and hookworms, allowing for elimination via the intestinal tract. Febantel is absorbed and metabolized and causes the metabolism of the parasite to become blocked, resulting in breakdown of the organism. There are no stated contraindications other than not using this product on pregnant dogs or on puppies younger than three weeks or weighing less than two pounds. This medication is only sold to licensed veterinarians and pharmacies. It's only available to consumers through the use of a doctor's prescription. Bottles come with 50 tablets per container.